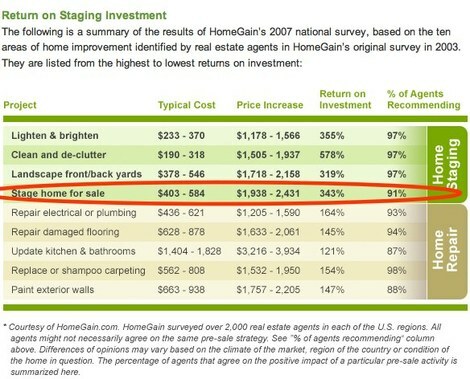 This has been making the rounds across the Web right now - it's a simple reminder of what sellers (and their agents) should be paying attention to. It doesn't matter if it's a home in Blacksburg, or Christiansburg, or Radford ... all of these things make a difference. The short list? And Jim Duncan adds #11 - "Price to the market; what you owe does not matter to the buyers or the market." Are you selling a home, or about to sell your home, and you're worried about the market? Let me take a minute to introduce you to Revisions Redesigns, a home staging and redesign company based in Blacksburg. Remodeling doesn't always make sense ... thanks to Tom Markiewicz for sending that article. Home staging, however, almost always pays, because it sets the home apart, as well as creates the environment for buyers to feel themselves in the home. Are you ready to call Revisions Redesigns now? You can find Machelle online, make sure to tell her you heard about her here!